A friendly reminder: Pears are in season! Now is the optimal time to take advantage of their delicate flavor and versatility in cooking and baking. Here are a few helpful tips for selecting, storing, and preparing one of the winter’s best offerings. When buying, look for pears without bruises. To tell if a pear is ripe, apply a bit of pressure just below the stem – if it is slightly soft, the pear is ripe. Note that this does not apply to Asian pears, which are picked ripe and remain crunchy. Pears come in many colors, so whether a pear is green, red, or brown is not an indication of ripeness. 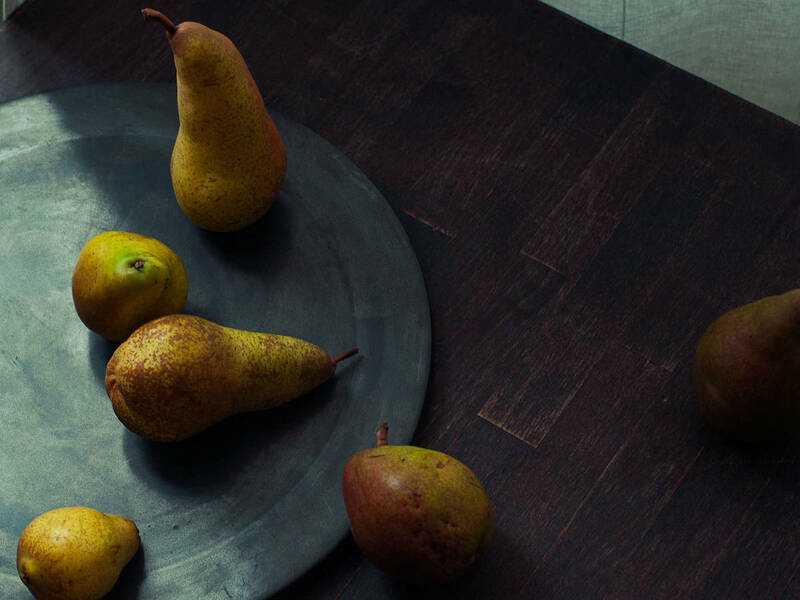 Store pears at room temperature until they are ripe, which can take up to a week or two. To speed up the ripening process, place them in a paper bag. If you notice that your pears are ripening too quickly, place them in the refrigerator to slow the ripening process. They will keep like this for at least another week. If you are preparing pears ahead of time, make sure to brush the cut surfaces with lemon juice to prevent them from going brown. For cooking pears, peel them first, as the skin develops a grainy texture when heated. In savory dishes, they pair very well with cheeses, especially blue cheese. Slices of pear add a buttery, sweet element to salads. You can prepare a simple dessert by poaching them in sweetened, spiced red or port wine. Or roast them in a hot oven with a bit of butter and vanilla. In any case, pair them with an acidic ingredient, as they are quite sweet by themselves and this brings out their subtle, almost floral flavor when cooked. If you are looking to store them, try your hand at canning and make our preserved winter pears. Last but not least, there are countless ways to utilize pears in myriad desserts, from the modestly sweet to the totally decadent. Check out the following recipes and pick one that suits your sweet tooth. Check back often for more delicious recipes that utilize seasonal produce!